Hansen: "The fraudulence of the Copenhagen approach" – "must be exposed." | Watts Up With That? Hansen: "The fraudulence of the Copenhagen approach" – "must be exposed." There’s an essay by Dr. James Hansen in the Guardian, the header of which is shown below. 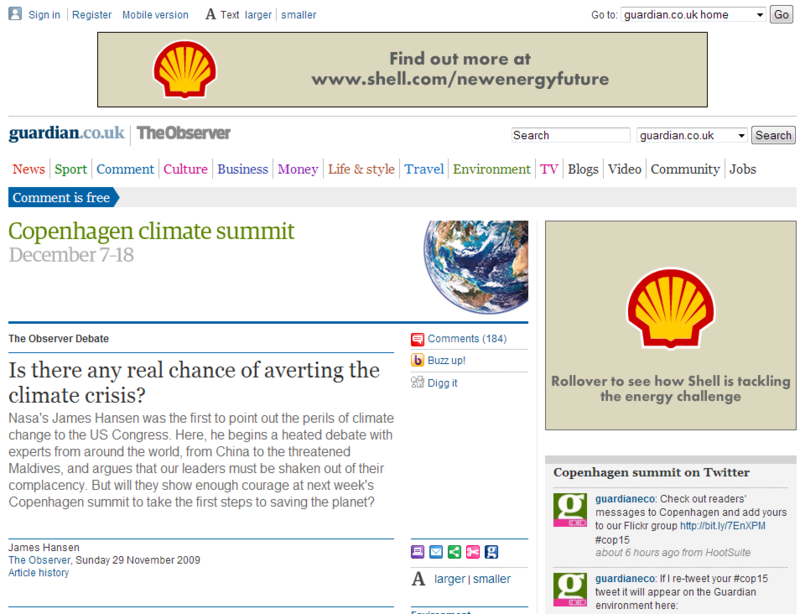 Next time people accuse of “big oil” connections for skeptics, point out that the most pro-agw newspaper on the planet is pushing Shell Oil ads. That distraction aside, Dr. Hansen has some stunning things to say, excerpts below. It is clear that Hansen doesn’t agree with the current direction. The plan that he outlines, while radical, certainly seems less damaging than “cap and trade”, which is primed for abuse and corruption of the system. November 29, 2009 in Climate News. What to do James. What “science” should we believe. At the moment from my perspective there is no science. What is left is political rhetoric based on Margret Meade or Malthus. It is time for James Hansen to step down from GISS. Enough damage has already been done by these profits of doom. Hansen needs a time out to discuss this with a good shrink, his fanaticism is a debilitating condition. All the pro-AGW folks should take a step back and a fresh look at any science (key word) that exists. I am shocked, shocked that you seem to be suggesting that The Guardian is hypocritical. It is kept alive by UK government job advertising and the recent sale (using a tax efficient offshore ‘trick’) of ‘Autotrader’ so their motives must pure. ” Science reveals that climate is close to tipping points . ” Try proving that , please , Dr. Hansen . This is just more rubbish from Jimmy . AGW is just as damaged as the original? climate data held by CRU. They are intertwined, inseparable at this point in time. The Earth cools, the Artic Ice rebounds, the Sun snores, land temperature records and rural recording stations are in a truncated state and the ocean is going absoutley nowhere. Prominent in my mind is the stunt urging activists to storm the coal-fired power plant of Washington DC and shut it down. There is much to set right before going down the road of examing anew the Earth’s Climate. Cap & Trade will accomplish nothing but misery and insecurity, leading to hostilities and global warfare. We knew that already. What we don’t know is how the Earth’s Climate works in precise manner. We surely need to know more about it, before going down any paths that are difficult to backtrack. Fee and dividend? Right. Like that’s gonna happen. The “Fee” part would, but forget any “dividend”. Hanson and the others on that article all want to send us back to 1850 life styles. Forget that. I much prefer electricity and modern transportation over candles ( or whale oil – and we know where that would end up! ) and horses. What if the proportion of any observed warming attributable to man is so small in relation to natural variability that we have several hundred years to sort out our sustainability problems with no current need to go for global energy rationing ? The proxy data has been shown to be inadequate in describing the full range of natural variability since it failed to capture the undoubted oceanic forcing of the late 20th Century. The MWP could well have been warmer than now as could have been the Roman Warm Period and Minoan Warm Period. AGW supporters accept the oceanic component now that they have seen the effect of a short L Nina. 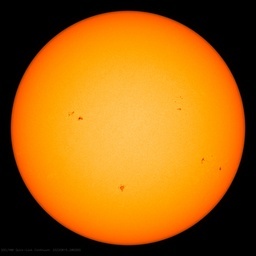 They previously accepted no oceanic or solar effect at all. Now they say that the recent temperature trend is due to La Nina and less solar forcing. To be consistent they must accept that ALL the observed 20th Century warming could be down to those two causes with a human component unproven and unquantified. The tragedy of climategate is that the incompetent tinkering with the historical data and the proxy data has made it less likely that more competent scientists will be able to unravel the past and learn from it. Furthermore there has been no progress with climate theory for 20 years because they lazily attributed all observed change to CO2 levels. As my writings show, there is plenty of evidence now available to support alternative hypotheses. In particular no one seems to have tried to create a consistent top down theory of the Sun/Ocean/Air/Space energy flow as I have done. The fact is that there is plenty of observed internal system variation at the interfaces between each component of the system. Enough to explain all that we have observed without invoking a measurable CO2 effect at all. C02 was blamed due to the absence of plausible alternatives. I have pointed out the existence of such alternatives. Those alternatives need to be properly addressed before attention should return to the issue of CO2 levels. The past 20 years of wasted endeavour need to be compensated for via a faster and more open minded climatological effort in the years to come. It is no use using models until there is a manifestly workable conceptual overview of the entire energy transfer system globally. At present they are inadequate and have been used only to try to validate a preferred scenario which keeps going out of sync with reality every time it is ‘adjusted’. Hansen has been saying this for some time now. He’s been a critic of cap-and-trade in favor of an outright tax. Maybe this is why he’s been out of the limelight lately. The Guardian is known in the UK as the Grauniad because of its propensity for mis-spellings on a grand scale. Its contributors are a pathetic bunch, in my view, and this is self-evident by their constant use of the (purposely intended) emotive phrase ‘Saving the Planet’. Until their whole raison-detre is finally exposed as fraudulent, they will continue to re-arrange the deck chairs on their version of the Titanic. He’s still the nutbar he always was. I note the Guardian failed to acknowledge that the next circus performer up was Ann Daniels, late of the Pen Hadrow Arctic Circus expedition. How seriously can you take someone who, by her own admission “dragged a sled 1500 km” for no real good purpose, and damned near killed herself doing it. And oddly, I have to agree with him. IF CO2 reductions are necessary, THEN cap-and-trade won’t be adequate, because it won’t materially affect CO2 concentration. No matter what scenario you pick, CNT won’t have any material effect, because of the logarithmic nature of the greenhouse effect. No matter what the question, Copenhagen has the wrong answer. Here in the UK the Guardian is known as the Grauniad because of its propensity for mis-spellings on a grand scale. In my view the journos and contributors are a sorry bunch who cling to the belief that they are always right about everything. Thus they insist on using the fatuous phrase ‘Saving the Planet’. Until their raison-detre is completely destroyred by the more rational and reasonable members of the human race they should be allowed to continue re-arranging the deck chairs on their Titanic. The Guardian closed the comments section of this article more hastily than usual. Only 5 hrs. Silence all dissent. Can’t accuse the guy of changing his stance. He should be careful using the word “fraudulent”, in line with what’s been coming out of Climategate’s e-mails & Harry’s “much read me”! Generally I don’t like the Guardian and its leftish approach. True, it is still pushing the pro-AGW line in the paper. However, it is allowing online debate to a far greater degree than its rivals. The Telegraph is a reasonable second, but The Times has hardly allowed anything at all to appear (though there was a chink today) and the Independent won’t go anywhere near the Climategate issue. So, on this occasion, some credit where it’s due. Well, it’s nice to see a little reflection and self-criticism in climate science. I’m kidding, of course, none of the conclusions have changed now that the data has changed, because the conclusions weren’t based on the data but rather the assumptions. The data was always just an inconvenience, as the reaction of the climatescenti now amply demonstrates. Like their progenitors in the green movement, it isn’t really pollution they want to limit, it’s people. They’re just more squeamish when it comes to talking about the consequences of their policies. What happens to the billions who depend on fossil fuels when we ban their use or tax them enough to price them out of reach? Oh, those people can’t move or feed themselves then? So what are we to do, firing squads, gas chambers, or just let them starve while surrounding them with guards like the Soviets did? Greens are always talking about the consequences of everyone else’s policies, it’s manifestly obvious why they don’t want to talk about theirs. As you can tell, I get a little worked up about this. It’s pretty much the first place I go when a greenie wants to talk to me these days, so far it’s a fair split between those who want to end the conversation suddenly and those who confess to being budding Stalins – a terrifying percentage. I would like to see those presented in this article address the energy needs of a growing population and what the alternative is, not including cold fusion and trying to pave the entire planet with trillions of dollars in solar cells (and batteries) or windmills (and backup generators). The more the limelight is away from him, the more he craves the attention, the whackier he gets. Hansen has advocated a tax and return 100% to citizens for some time now, and I haven’t heard much discussion about it. It certainly seems more efficient, but it could be a big problem for energy importing countries. I’ll leave it to the economists. How about the first debater, Ann Daniels: “It’s too late for the Arctic, but it’s not yet too late for us” Hey, she was on the Catlin boondoggle. So why do we even bother to monitor the Arctic if it’s too late? We might find ice there? Note its published today and comments are closed. Typical Hansen. He’s proposing an old socialist concept called the ‘social dividend’ where, rather than the government inflating the currency with debt it borrows from a private bank like the Federal Reserve Bank (its not publicly owned), it should go back to printing its own money and pay out a dividend to every citizen, funds earned from leasing federal land and water to mining, drilling, ranching, lumbering, fishing, hydropower, irrigation, etc. Now, Alaska already has something like this, depending on oil prices every Alaska resident earns $1500-2000 per year from oil revenues (the snowmobile dealers always have great deals in snow machines at the price equal to whatever the oil royalty check is). Now, a problem with this whole concept of course is where is the money coming from to pay for all this? The fees government charges those who use the resources pass those costs on to those who buy their refined products, which gets increased in every step in the distribution chain until it reaches us consumers. Whatever we receive in a social dividend, we wind up paying that plus 100% over that, or more, once every level of distribution has added their administrative overhead costs…. So, no thanks Hansen, we dont need another big socialist screw job. It seems the pro-AGW melons are getting highly confused. They can’t get their desired wish (close down as must industry in the west as possible while leave the east burning cow dung), so are starting to realise they have buggered up. There’s not much longer to run on this. @ Chris S (11:12:03) :The Guardian closed the comments section of this article more hastily than usual. Only 5 hrs. Silence all dissent. There are a lot of deleted comments, too. Also from the Guradian blog November 25. Climate Rationalist? Him? He still doesn’t get it that the lies and the Vast Right Wing Conspiracy is among those that he refers to as “rationalists”. It is like a train wreck happening in slow motion and watching bodies thrown out of the cars. You can’t look away. Will Poor George figure out just how badly he has been had? Or will he wander endlessly through the darkness babbling about Oil Company conspiracies? Well, what Hansen proposes might eliminate some cap-and-trade fraud, weird corruption, and insane oscillations of the new grey market, but it would still be more damaging to the economy. He might prefer something like a direct tax but it would have to be huge in order to reduce (!?) CO2 to his 350 ppm. So the energy prices would have to jump ten-fold, or something like that. So there is some trade-off between some potentially “more ethical” proposals by Hansen and those that are “less ethical” but still “relatively less damaging” such as Kyoto which doesn’t do much on the global scale (except for creating a few carbon billionaires and feeding a few thousand bureaucrats) – which may be a good thing. “Real” regulation a la Hansen could be more ethical but much worse in its consequences for all of us. My guess is that Hansen feels like a carbon tax might be easier to obtain than cap and trade. We shouldn’t accept any “carbon” regulations until all the previous papers have been verified – including raw data, meta-data, and code. Another consideration here is that neither the carbon tax nor cap and trade will bring down CO2 levels anyway. That would take huge cuts by China and that ain’t gonna happen. No one wants to commit economic suicide by reducing use of fossil fuels. Anyway, the odds are there is no reason to do that in the first place. The science isn’t even in yet. Since their circulation seems to be based on putting large pictures of polar bear cubs on their frontpage, I’m not surprised either. WRT The Daily Telegraph – I think the MPs expenses horror has given them the bit to run with this before the rest. The Times is catching up rapidly with their guest articles from Nigel Lawson et al. Together these two have about 3/4 of the serious press readers. We need the broadcasters and the Sun [biggest selling tabloid at 3-4m a day] to follow suit. Dr. Hansen is very pro nuclear. He is spot on in his criticism and is joined by many environmentalists. His preference is a direct tax, which at least is a more honest approach. He also wants a huge and quite impossible redistribution system to repay the costs to the people. Both the wrongly termed cap and trade and tax and redistribute are based on the erroneous assumption that raising the price of carbon will necessarily bring more alternatives. It is as likely to make both unaffordable. In this case Hansen makes it clear where he stands. I thought it was the Grauniad. Pure positioning, chaps and chapesses. After all, JH has a lot invested in being ‘The Prophet’, and the real knack to prophecy is spotting a far-off bandwagon, and hopping aboard first. (Although one must wonder just what the catchy slogan could be, here – tax is soooo boring). But I digress. Think Carnival, not Science. Barkers, hustlers, fortune-tellers, animals in cages. And every man-jack of ’em wiv there long fingers in yer wallet. Re: Grauniad: Ooops! I see Mike at 11:45:09 beat me to it. Who’s right? the Alarmist? The scepticist? Either way we are doomed. Oh no, I think I have just became an Alarmist sceptic! Hansen should have been on our side all along because the real issue is and has always been long term energy security. The use of climate fears to push a security agenda made things worse, held back development and gave rise to cap and trade. In fact, cap and trade gives governments and energy companies little incentive to develop advanced energy technologies if CO2 can be made so profitable. Hansen is getting old he has no time to see his Utopia materialize slowly with cap-and-trade he wants his Utopia right now so he can be more equal than the rest of us immediately. Didn’t I read something about Shell wanting the restrictions on trading carbon credits so as to allow the trading of _derivatives_ of carbon credits? I do believe Shell wants to play both sides here. I wouldn’t advise using the motives of Shell as a logic point. I’m writing a paper for my class on the GW. I bought some magazines, and all renewal energy ads were shell, chevron, and once in a while some unheard company(most likely an offshoot from these big oil and banking dynasties). PS Can anyone direct me to a peer-reviewed paper which proves temperature trends precede CO2 trends? Ole buddy Hansen. You have some 3 year old Freedom of information covered requests that you haven’t answered. Have your boy gavin gett off the blogging and crank out the reports. They are due before you get ijnvestigated. Be carefull not to delete information. In an ever changing world, filled with chaos and uncertainty, Hansen stands out as a constant. Hansen is clearly deranged. The data doesn’t matter to him. Whether the data is good or bad or even if it is faked, his conclusions are the same – humans will perish in flames unless they stop using energy. Hansen is demanding that mankind take a hit in their income to the tune of trillions of dollars and all because he sees “tipping points”. Most dangerously deluded men merely see “ghosts”. Like my Grandfather said, ‘Often wrong, but never in doubt’. I’m not familiar with the US press, is the WT a major player? They’ve been front and centre with this story since it broke. Here’s a better one wrt Hansen. <"Dance first. Think later. It's the natural order." which is why the Malthusian elites want it. In most of the western world, and especially in China we are about 50 years away from massive population reductions from a low birthrate. Energy security from say coal, oil or even the ultimate renewable – wood, should probably last us ok. The problem is political, because most of the huge oil reserves in Alaska or Montana have been capped and declared off limits, till most of us are gone anyway. Other energy sources like Natural Gas or uranium appear to have a 15 – 30 year lifespan at best. There’s much we can do to be more efficient but sequestering CO2 is surely the stupidest thing imaginable. Let Africa burn coal or oil, get over it. As usual I’m casting out the question – does anybody have info about how CO2 generated at ground level is supposed to drift upward to the upper atmosphere, when CO2 is heavier than air? Although it may have been lazy, this science of ‘consensus’ needed to be as simple as possible for the new adherants to understand. And don’t forget a lot of the new recruits were non scientists who had to get the message and spread it amongst the population, including grade schoolers. In reality CO2 is what we breathe out, and what our energy sources emit, so it was a no brainer – it had to be the enemy, lets just create the fudgy science to justify the new carbon reduction scheme. We’ve already had reports from Australia that they want to have a tax on babies for their assumed ‘carbon footprint’. So the plan has been successful, it was a political plan, maquerading as science. The scientists, ever the most politically naive in society, were the easiest to dupe. To me this whole AGW idea really should be relegated to being the subject of cocktail party chatter, not an actual funded economic reality. In contrast it is taught to schoolchildren as fact, as morality even. There are a lot of problems in our world and they largely stem from the elite bankers who manipulate our world. From the forced fluoridation of our water (lowering our IQ’s), to the forced government schooling cranking out dumber and dumber pupils, to a corrupt justice system, media collusion etc. etc. But CO2 production is the problem – ya right! And has anyone looked at Hans Schreuders work helping to explain that there is no Greenhouse Effect after all? Dr Hansen disagrees because Cap’n Tax isn’t draconian enough. Any of these college professor ivory tower CO2 reduction schemes will do nothing to stop global warming, since it stopped in 1998, death due to natural causes. They will just make life less pleasant for us non-elite schlubs. …Any of these college professor ivory tower CO2 reduction schemes will do nothing to stop global warming, since it stopped in 1998, death due to natural causes. Big oil companies know the oil supply is non-renwable. Sooner or later it will be very expensive and supply limited. They could not wastes the billions invested in energy infrastructure. They need big government subsidies to develop renewable energy and more energy efficient cars to extend the usefulness of their reserves and infrastructures. What better way to get the subsidies than all the hysteria on carbon dioxide emissions and AGW. Aside from the subsidies, oil companies use the RD subsidized renewable energy technologies and pilot programs for advertising. Oil companies emphasize conservation as a main platform to counter balance any criticism on their exploration problems. If oil companies funded skeptics it was to kick start the debate and make it more emotional. Big oil companies are the real winner. Hansen: “Science reveals that climate is close to tipping points.” So more than one tipping point now. That could be useful if the first one doesn’t work. It’s pretty impractical. Imagine trying to capture exhaled CO². That’s about how stupid it is. Very easily. The molecular weight of CO² is 44. Air is 29. Not very different. If heavy chlorofluorocarbons can make it to the upper layers of the atmosphere, CO² can, too. Just takes a little wind to mix it up. I looked at the link and it’s a little weird. It’s complex enough I can’t rule it wrong, but he looks at things differently than I’m used to. He overemphasizes the “greenhouse” analogy, which is known to be false by virtually everyone, except maybe Al Gore, who is scientifically challenged. Schreuder’s language is also a problem. I’ll have to study it a little, but I’m not optimistic of anyone brushing away the basic physics in a few pages. I’m skeptical. Coal burning is quite damaging, regardless of CO2 output. Coal mining is even worse. Greatly reducing the burning of coal seems like the right thing to do – it is the elephant in the room for several pollutants. As much as I find myself agreeing with some of his sentiments (he is one smart man)….on the other hand I agree with some of the other posters here…that he is flirting with insanity. Certainly some narcissistic and paranoid characteristics rule his brain. QUESTION: What in the blankety blank Sam Hill is a GOVERNMENT employee, a public servant, one who gets his paycheck from the taxpayer, voicing his opinion as he does here, trotting across the globe inciting protests, and blocking coal plants??? Hahaha remember his Global Warming Protest that he organized that was almost shut down by a heavy March snowstorm in DC this year?? No he doesn’t. For all his brilliance….he IS mad. And he continues as the NASA Goddard director…because this administration has NO qualms whatsoever…of keeping him on. Madness….and at the taxpayer’s expense. Hey Jim….GET back to astronomy and do your job (you work for us!). Now THIS is the kind of thing the Australian Libs should be all over. Oppose the ETS/CPRS because BOTH sides of science oppose it – skeptics and warmists alike. You guys may dislike Hansen but what an ally in the push against an ETS. Man o man. Censorship is ugly. More ugly than death threats or swear words. I’d much rather have a “I am an adult and I want to see mad, sweary or mean comments too” option than have moderators hide comments. Still at least you can see censorhip at the graun. The Times has been auto suppressing my comments for three years, since I pointed out the Mathew Parris was a liar. in a dry year of course.No mention of the recent abundant snowpacks, of course…. Well, Hansen isn’t stupid, and he’s got some talking points on this particular issue. He’s still about 90° off course, nonetheless, but that’s an improvement. I say we ask him to comment here on carbon taxes vs ‘capped&betrayed. OT: In other unrelated news: “Complexes contain archetypal images that lie latent in the unconscious until being somehow stimulated, at which time they can, in certain cases, take complete or partial possession of the personality. I have trouble trusting James Hansen and George Monbiot even if we seem to find occasional common ground. But who knows, maybe they’ll drop their politics and environmentalism one day and see some unbiased light. Within the past week WUWT ran a piece on New Zealand temperatures with a graph having the past temperatures lowered, prior to 1955ish, and raised thereafter. Looked curiously like GISS temperatures, must be a coincidence. Hansen may be on a different track than the CRU cabal, but I can’t help thinking the kettle is calling the pot black. These scientists clearly have an political agenda. Noticed a presentation bt Gavin Schmidt that he gave at ICCC Hong Kong Oct 2009. Not much science in that presentation..
Hansen has reached a personal tipping point, the line between sanity and obsession. Can anyone point me to the proof for his claim that 350 ppm of CO2 is the correct amount for a stable climate? A stable climate? Hansen is no longer an objective scientist, he is an ideologue and a dangerous one at that. You are neglecting (as most do) the royalties that oil companies pay to the mineral owners. On state lands and near offshore the state gets 12 to 25 % (before taxing the rest). On federal lands or federal offshore (usually 3+ miles) the feds get that. Alaska can return money to the residents because their population is small compared to the oil production. California, to use a different example, spends all the royalties and more and more, ad infinitum. Hansen needs to be sitting in front of a Congressional investigation, not running his mouth in the papers. Hansen belongs to the environmental activists that intend to shackle the world population under a communist rule. Gore’s track is a corporatist approach, read fascist. Both have the potential to screw up our lives, so I reject them both. They are pure evil ideologies and both Gore and Hanson belong behind bars. Just to expand what Nigel S wrote about the Guardian surviving on government job advertising, a considerable part of that is … jobs at the BBC! Media Guardian is the principal route into Al Beeb. Unless you were at Oxford or Cambridge, of course, and therefore already have some little chums on the inside. The problem is with (4). That The Guardian retains editorial control does not mean that other groups/companies/etc do as well. I’m sure there are ways to argue against the “all the studies denying climate change were funded by oil companies” attack if in fact those studies are reality-based, but this certainly isn’t it.